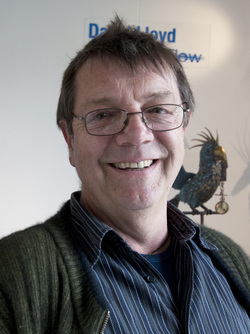 Welcome to the website of talented New Zealand artist and craftsman David Lloyd. Working with metals, wood, stone, enamel, glass and re-purposed objects David creates a vast array of sculpture ranging from tiny moth brooches to two metre wide lifelike spiders, enormous pea pods and delicate miniature eels, and all sorts of fantastical and beautiful creations. Currently based in Christchurch New Zealand, David works from his private workshop to supply galleries and customers around the country and further afield. Another fascination for me has been the discovery of 'Steam Punk'. I have created several works using the idea. My work takes on a mechanical, industrial look and I will pursue it with interest..."
As an extremely creative and professional craftsman his work is constructed to the highest quality and is currently found at universities, art galleries, political buildings, eating and drinking establishments, in various public spaces and in many private homes and gardens.